Perl CyanChat Client (PCCC) is a chat client for CyanChat, the official chat room of Cyan Worlds, Inc..
Full support of Version 1 of the CyanChat protocol. Save the conversation in XHTML format, keeping colors intact. 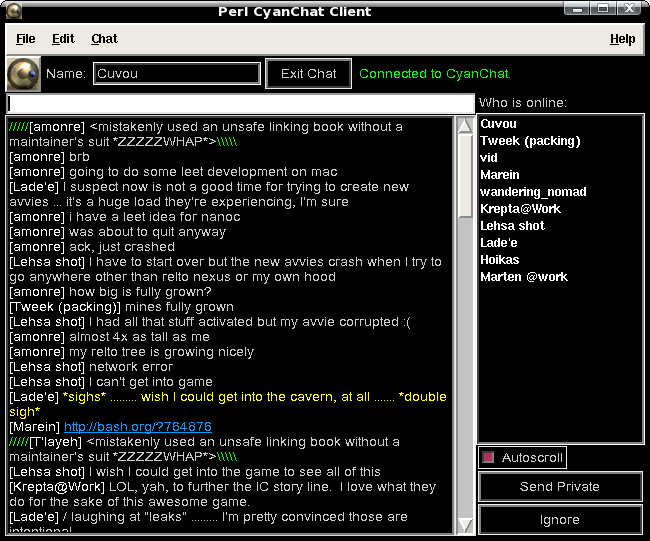 Configurable "default nickname", and the ability to automatically sign you into the chat when you connect. Configurable CC host and port, automatically connect on startup, and reconnect when disconnected. 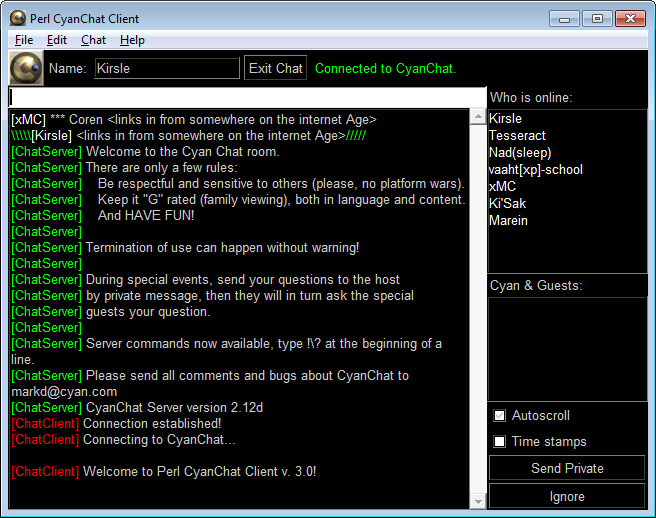 Configurable colors, both for the main window and for the chat message and nickname colors. Configurable "echo" color, so that your own nickname in chat will show up in a different color, so you can quickly distinguish your messages from everyone else's. Clickable hyperlinks when they appear in chat. Support for IRC-style "/me" actions. Messages in the format *...* can be displayed as "/me" actions automatically. Private message windows so you can chat privately in an Instant Messenger style. Option to automatically ignore users who ignore you. Option to notify you when users ignore you. 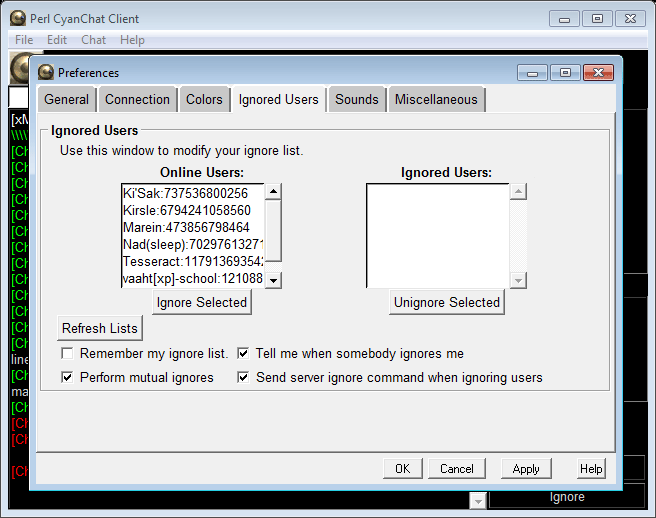 Option to send a "real" ignore command to the server when you ignore a user (as opposed to a local ignore). 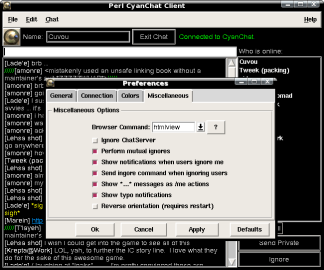 Options to reverse the orientation of the chat client, so that new messages appear on the bottom, and the input text box is at the bottom (like most traditional chat programs). A full built-in documentation system. Built-in packet viewer with the Debug Window / Console. A dialog to send raw commands to the CC server. PCCC 3.0 running on Windows 7 Beta. Ignore List preferences on Windows 7 Beta. PCCC running on Mac OS X using X Windows. Linux: A tab from the Preferences window. Windows XP: PCCC with a couple dialog windows open. Windows XP: PCCC 2.0's main window. It's recommended that you download the latest version of this software as listed below. To download older versions and source code, skip to the next section. The following are all the distributions available for this software, starting with the most recent. Source code is also available for all versions.